Every USSR player is entranced by Blockade and the opportunity to take over Europe‘s most stable battleground. But most play it poorly. Beginner USSR players will do things like headline Blockade or play it in the middle of a turn. Better USSR players play Blockade slightly better (e.g., on their final Action Round), but still poorly. Strong USSR players know that strong US players do not forget about Blockade, and so will either play it for Ops and let Blockade come back later in the game (maybe the US will forget about it then? 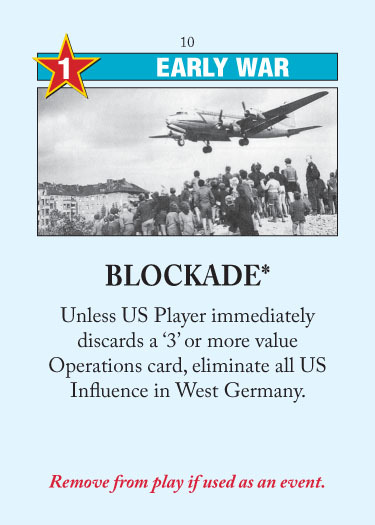 ), play Blockade when US is Purged (which is very strong, because there are no Soviet 4Ops events in the Early War), or count the Early War cards and play Blockade only when US has no more high cards. Very strong USSR players know that strong US players try to hold either Decolonization or De-Stalinization until Turn 3. Therefore, they play Blockade on Turn 1-2 to cut the US handsize and therefore force them to discard Decolonization or De-Stalinization before Turn 3, so that they come back before Turn 7. Always have a 3 Ops USSR event on hand until Blockade is gone! If the USSR punts it away on Turns 1-2, you have no choice but to be wary of Blockade throughout the Mid War. Accordingly, even if you get the chance to send Blockade to space (via Containment) or play it with UN Intervention, it’s often better to just trigger the event so you don’t have to worry. If you draw Blockade, it’s usually not a problem to deal with. If you have no 3Ops or higher card (maybe you were Red Scared? ), Blockade is going to be your hold card, and you’re going to like it. As above, it’s important to note that if you do draw Blockade with De-Stalinization or Decolonization before Turn 3, you simply won’t have the ability to hold those cards until Turn 3 without playing the China card. So you’ll usually have no choice but to discard De-Stalinization or Decolonization before the Turn 3 reshuffle. If you must trigger Blockade and you have no card to discard to it, then make it an AR7 play (AR6, technically, in this case), which will help mitigate the damage. And who knows, maybe you’ll be in luck and the USSR will play Containment and you can either space Blockade or discard a 2Ops card. Riku Riekkinen suggests that if you have Blockade and Decolonization or De-Stalinization in your hand on Turn 1, then you should consider an opening setup that leaves West Germany empty. The goal is to be able to play Blockade without discarding any cards, thereby allowing you to hold Decolonization/De-Stalinization until Turn 3. With an empty West Germany, the USSR is forced to choose between couping Iran (and allowing the US to play into West Germany with Blockade on AR1 without discarding any cards), or taking West Germany (and allowing the US into Afghanistan). A good example of this play can be seen in Annotated Game #2. This entry was posted in Early War, USSR Events and tagged blockade. Bookmark the permalink. I have really enjoyed reading your blog. It just makes me reaaly really want to play right now.!! I actually think leaving West Germany is very valid opening for US with almost any cards. As the 2nd turn cards can easily validate it. i would love to know more about this idea, or see it fleshed out to a greater degree. this is such an intriguing thought just dangling by itself! would love to see more written up about it! what on earth do you mean? why would you want to leave a 4 stability country that has very few cards that target it? See the last paragraph of the article. There’s also an argument to put just 1 influence into W Germany in that case, so that even a 4-card doesn’t give the Soviets control. Leaving West Germany open is especially good idea if you happen to have Blockade and Truman doctrine. It is always nice to wipe out a large amount of red influence with a 1-op card. Soviet player should always be careful about this card and make sure he keeps West Germany under control if he chooses to move there. If I have Truman, I’d almost definitely put 1 influence into W Germany in that case, so that even a 4-card doesn’t give the Soviets full control. This is truth, leaving west germany empty. Better try to hold in only one battleground (like italy, since france can be hurt by gaulle and suez crisis) and avoit control, giving up europe and trying to get into asia. Europe is just too ops expensive, and decon and desta could easily cost you the game. 1. As the US, if you have Blockade plus Decol/De-Stal and you opt for an empty WG setup, should you headline Blockade? It seems like if you don’t then you are forced to play a 1 op card early in the turn, and there are many situations that I can think of when that would be unappealing. Basically, how should you play out your hand if you opt for this opening? 2. As the US, if you don’t draw Blockade or any 4 ops cards, should you opt for the empty WG setup? Reason being that the USSR might have Red Scare and Blockade in their hand, and if they headline Red Scare and then play Blockade then you’re in trouble if you have 4 influence in WG and nothing to discard to Blockade. As the Americans, I’m unclear regarding your point, “… then make it an AR7 play (AR6, technically, in this case), which will help mitigate the damage”. If I understand the card correctly, if you wait to the last AR and if you must play Blockade, the damage to West Germany must still be done. Since you have no cards left to discard you must remove all US influence. So I’m unclear on how the damage is mitigated? The only way I can think by which you mean the term, “mitigated” is that since its the last play of the turn, USSR has no immediate means to take advantage of the situation and (hopefully) some magic can hapen in the beginning of the next turn (HL phase or AR1) for the U.S. to get those IP back. But as this is based on hope, its definitely not a mitigation strategy. I’m definitely missing something. The point is – if USSR want to take WG over, they have to give up the AR1 Battleground coup. 2. WIth Containment on AR7 (like above) if you not space it, you put 2 Influence there which is always better than 1, cause it makes hard to take it;). 3. If your opponent played China current turn, its face down for you. But next turn it will be face up to you, and will probably help you win Influence war for WG. 4. Truman Doctrine didn’t show up so far, you can have it on next turn, and wipe out 4 Influence played there by USSR. Event if you don’t draw it on Turn2, there is a chance that it is still in the deck and your opponent will fear too much to enter WG. 5. Last but most important for TS strategy: No real magic have to occur on HL or AR1, you just give USSR play a choice between battleground coup and taking West Germany. If he chooses WG, at least you have battleground coup – you get something “in exchange”. I just played my very first game of TS, so I apologize beforehand if I say something silly. Here it goes: if the Soviets play Blockade and the Americans discard something favoring the USSR, will that event take place or is it just discarded without anything happening? Whatever the answer, would it apply to similar situations when your opponent is forced to discard something? Events on discards do not happen unless otherwise explicitly noted (e.g., Five Year Plan). Maybe it’s not a strong play, but I will play Blockade as the US and discard De-Stal if that opportunity arises, which is hopefully in Turn 3, but even in Turn 1 or 2 because there’s a decent chance the Soviet player does not get it the first couple Mid-War turns, and as the game progresses it’s not as powerful. Technically, in terms of verbage, wouldn’t the US player be “Scared,” not “Purged”? I realize this is pedantic to the point of comedy.